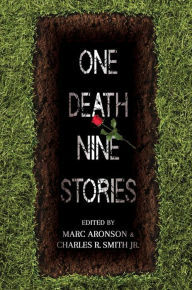 Nine short stories loosely tied together around the funeral of a nineteen year-old named Kevin Nicholas. Hearing the premise, I figured the stories would tend to the morbid and dark, which did not turn out to be the case. The key is that for many of the stories, the death is peripheral at best. Instead, as the editors explain in the afterward, the unifying theme is "initiation." This is interpreted in a variety of ways ranging from the obvious (Ellen Hopkins's and A. S. King's stories of sexual initiation or Torrey Maldonado's testosterone-poisoned tale of hazing) to the more subtle (Will Weaver's redemptive account of learning to shoot a gun). I have my favorites of course -- A. S. King's piece is by far the most indelible of the set -- while some of them didn't speak as well to me. However, what helps is that the writers and their styles are generally compatible, which makes the collection readable as a whole, rather than as disconnected stories. The final result is surprisingly effective and demonstrates a lot of cooperation among the writers and editors and melding their stories together.